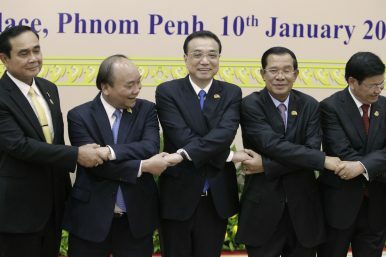 China's Premier Li Keqiang, center, shakes hands with his counterpart, Nguyen Xuan Phuc, second from left, of Vietnam, Prayut Chan-o-cha, left, prime minister of Thailand, Hun Sen, second from right, of Cambodia, and Thongloun Sisolith, right, of Laos, before an opening of the Lancang Mekong Cooperation Leaders' Meeting, in Phnom Penh, Cambodia (Jan. 10, 2018). The LMC was born from China’s unilateral dam building, but that same fact may also undermine the forum in the end. Since its establishment in 2016, the Lancang Mekong Cooperation (LMC) forum has been successful for China. The group, which includes the participation of all riparian countries, has made progress on several issues, all while excluding extraregional powers such as Japan and the United States. Therefore, the LMC is often interpreted as being Beijing’s challenge to or even replacement for the current mechanisms on the Mekong River, in addition to acting as a miniature version of Belt and Road Initiative (BRI). The achievements and potential of the LMC can be attributed to several reasons, such as China’s national power and economic aid, but its geopolitical fait accompli on the Mekong stands out as well. The geopolitical fait accompli refers to Beijing’s dams on the Lancang River (the Chinese name for the Mekong), a factor directly influencing the downstream countries. Although extraregional countries, with their considerable national capacity, are able to provide funding and other forms of aid for development in the region, they cannot supply any effective alternative to the river water held by the Chinese dams. Aside from joining the LMC, downstream countries have no practical avenue to increase the flow from China. Beijing can use sovereignty as a shield to reject external concerns over its dam building and related water issues from other organizations and arrangements centered on the Mekong River, as well as individual riparian countries. The sheer gap of military capabilities between China and other Mekong countries make violent options, such as missile attack or sabotage, unpractical. In contrast, water resource management is the main function of the China-led LMC, and thus the LMC will be a more effective way to solve problems that other Mekong forums and organizations cannot deal with. The timing of major dam construction on the Lancang River sets the timeline for China’s fait accompli. Beijing began the dam construction in the mid-1980s; the pace accelerated in the 2000s, then reached its peak in the 2010s, with the huge-capacity Xiaowan and Nuozhadu dams respectively commissioned in 2010 and 2014. The existing dams served to confirm China’s determinant role, particularly during the dry seasons, on the Lancang/Mekong River has been confirmed, while other dam projects that would further that influence are underway. Meanwhile, Bangkok’s proposal of minilateralism excluding extraregional participation was adopted by Beijing under its plan for a new Mekong forum — the LMC — in 2014. It is difficult to know whether the LMC was a long-term plan all along, or an improvised idea under Xi Jinping’s active foreign policy, but either way it benefited from the fait accompli of dam construction. If China had launched the proposal earlier, especially prior to 2010, pressure over the construction and management of the megadams would have been strong; halting work may even have been a condition for some riparian countries, such as Vietnam, to join the initiative. After the dams were commissioned, the opposite is true: the LMC presents perhaps the only effective way left for other Mekong countries to coordinate with Beijing regarding water resources. Such a fait accompli is not rare in China’s policy practice, but most other examples, such as the artificial islands in the South China Sea and the Air Defense Identification Zone (ADIZ) in the East China Sea, are mainly aimed at securing better strategic circumstances, rather than building a multilateral initiative like the LMC. The LMC could thus be seen as a marriage of fait accompli, China’s conventional wisdom, and outgoing engagement, which is central to the BRI. The water resource of those dams is thus not unilaterally reserved by Beijing, but transformed into “public goods” shared with other Mekong countries. Furthermore, China added various early harvest projects into the LMC to provide aid to other riparian countries. All the same, Beijing’s application of its fait accompli makes the LMC more relevant than its counterparts. Despite the benefits for China, the fait accompli presents some challenges to the LMC. Structurally, China will be blamed for disasters and other water issues along the Mekong River. In the past, floods and droughts occurring along the river were viewed as natural disasters, but the Chinese dams are now a convenient target to be blamed for similar disasters, whether that’s true or not. How well the LMC responds to such blaming scenarios will matter for Beijing’s credibility in the face of other members, since the relations between them are supposed to be equal according to the organizational principles. Moreover, China loses considerable freedom of using its dams and water flow as a policy tool. Without the LMC, Beijing could unilaterally increase or decrease water flows downstream which affects the rest of the riparian countries, whenever it chose, including to “teach a lesson” to a regional country. Similar to its punititve trade practices targeting Japan and the Philippines in the early 2010s, China could openly claim some “technical reasons” for adjusting the water flow, or merely keep silent, in parallel with making demands through hints or private channels. But the LMC with its Lancang-Mekong Water Resources Cooperation Center (LMWRCC) would make such measures unpractical, as long as Beijing wants the organization to remain meaningful. In short, the LMC will put some constraints on China’s autonomy or sovereignty in managing its dams on the Lancang River. Such cession of power is rare in China’s practice of foreign relations (contrast, for example, China’s attitude in territorial disputes). Therefore, the ultimate challenge facing the LMC will be the extent to which Beijing is willing to be restricted by its obligations. If the LMC cannot bring in enough interest to compensate for China’s loss of autonomy, Beijing’s lukewarm or ignorant attitude toward its own project would be destructive. Without Beijing’s contribution, the LMC would not be meaningful for the other riparian counterparts along the Mekong River. Shang-su Wu is a research fellow of the Regional Security Architecture Programme at the S. Rajaratnam School of International Studies (RSIS), Nanyang Technological University in Singapore. A book review of Last Days of the Mighty Mekong, Brian Eyler, Zed 2019.